The Lodge at the Lake LLC would like to welcome you to Great Lake Erie and all the wonderful attractions of Northeast Ohio. Nestled on 22 acres with an additional 40 private hunting acres, the Lodge has been recently renovated, featuring amenities such as a large 30x30 patio, game room with pool table and wood burning stove, a Jacuzzi tub, two fully furnished bedrooms, and two easy access bathrooms for your comfort. Whether you’re hunting, fishing, vacationing with family, or attending Conneaut’s renowned D-Day Reenactment, there is plenty of room for relaxation at the comfortably furnished Lodge at the Lake. The Lodge at the Lake boasts an ideal location in Conneaut, Ohio, close to numerous local attractions, yet private enough for true relaxation. Only three miles from your doorstep, you’ll find one of Lake Erie’s most beautiful beaches and parks, Conneaut Township Park, as well as boat launches, public docking, fishing charters, and casual dining. Whether you’re an avid outdoorsman or a family vacationer, we have everything you need right here at The Lodge at the Lake LLC. The courteous and knowledgeable local staff is here to ensure that your stay with us is perfect. We can assist with booking fishing charters or hunting guides, providing directions, or even just suggesting a great spot to grab a bite to eat. Hunting in Northeast Ohio is at its best when you stay with us, The Lodge at the Lake LLC. 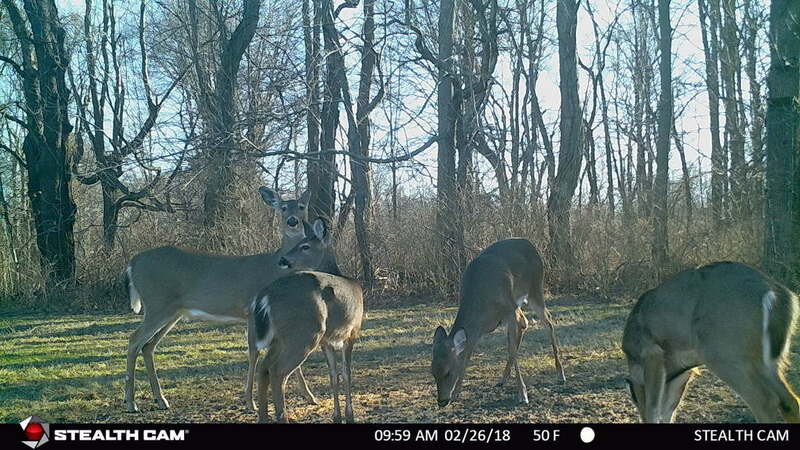 Bring your crossbow and plenty of bolts, so you can hunt from one of the well-placed blinds or stands right in your own private 60-acre back yard… you may just take down one of the area’s wild non-typical bucks that score well into the 200 class! If rifle hunting is more to your liking (which Ohio now allows with a straight-walled round), be sure to ask us about the area’s great public lands. 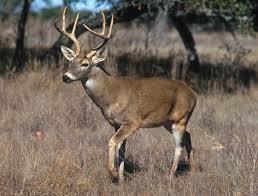 Bow hunters, are you looking for the rush of that pin point shot? Then its turkey you seek! Whether you prefer the art of the traditional recurve bow, or like the pure power and accuracy of the modern compound bows, The Lodge at the Lake provides ample opportunity for you to test your skill. ​Please call now to book your hunting and fishing reservation with us now…. Turkeys are frequent visitors here at The Lodge at the Lake. Just check out these shots from our trail cam! Imagine one of these fine fowl at the center of your next holiday feast! Grab your quill and your crew, and reserve your stay now! ​Did you know that the turkey is native only to the United States? In fact, founding father Benjamin Franklin lobbied to have the Noble Turkey declared as our country’s official national bird. Thankfully, the bald eagle won the honors, freeing up the turkey for your hunting pleasure. Gobble, gobble! Twenty one miles of Conneaut Creek in Ashtabula County, stretching from the Ohio-Pennsylvania border to the old Penn Central Railroad Bridge in Conneaut, have been designated a State Wild and Scenic River. 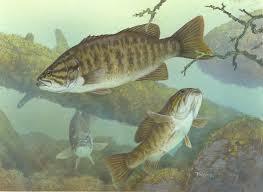 The stream corridor is home to many species of fish, including walleye, northern pike, and smallmouth bass. From late October through April, Conneaut Creek boasts some of the best Steelhead trout fishing you’ll find! The creek is stocked by both the Ohio Department of Natural Resources and the Pennsylvania Boat and Fish Commission, so both spring-run Manistee strain steelhead and fall-run Pennsylvania strain steelhead are abundant. The season peaks in December, when the steelheads reach the northern portion of the creek. Public access points to Conneaut Creek include Old Main Road, Center Street (near CLYO Ball Park), Keefus Road, Creek Road, Farnham Bridge, Furnace Road, Conneaut Breakwall, and Conneaut Harbor. If you’re looking for a fight on the river, you can’t go wrong with Conneaut Creek. happy to provide a recommendation. The Lodge at the Lake fills quickly during peak hunting and fishing seasons. It’s easy to reserve the dates of your choice. Just call 440-265-9225, or fill out our quick form. Fishing and hunting may be our main attraction at The Lodge at the Lake, but that is just the start of everything that Conneaut, Ohio has to offer. When you stay with us at The Lodge on the Lake, you will be able to enjoy all the other attractions and vacation fun we have in North East Ohio. Enjoy a picnic in the park and spectacular sunsets on the sandy beaches of Conneaut’s beautiful Township Park, only three miles from your front door. The adjacent sand bar boasts some of the best windsurfing on the Great Lakes. Nearby, the Conneaut Port Authority offers transient docking and public launch ramps. In July, the Wine & Walleye festival celebrate the bounty of Lake Erie’s walleye catch with live entertainment, a craft beer tent, wine tastings, and new for 2018, a sailboat regatta. In August, stay at the Lodge and celebrate the WWII’s history-changing Normandy beach battle at Conneaut’s renowned D-Day Re-enactment. ​When it’s time to wind down, kick back and relax on our 900 square foot patio, or enjoy a game of pool in the basement game room. You can prepare dinner in the Lodge’s fully equipped home-style kitchen, or mingle with the locals in Conneaut’s restaurants, which, if we do say so ourselves, serve up some of the best food on the Great Lakes. After a great morning in the woods, a big breakfast down by Conneaut harbor is waiting. In the evening, after you take that big buck with that amazing shot, feast on barbeque or burgers in the marina while you tell your friends how you took your bow and at 30 yards you’d seen him, Ashtabula’s next record buck, then release, he was down before your string stopped singing! Conneaut’s ideal location, between Cleveland and Erie, places you close to numerous regional attractions. Visitors to JACK Cleveland Casino and Erie’s Presque Isle Downs and Casino will appreciate the peace and quiet of the Lodge at the Lake after an exciting day at the tables. The Lodge at the Lake LLC is your year-round fishing and bow hunting destination! It’s also ideal for family reunions, bachelor parties, and staff retreats. Call now and book your stay!